Archbishop Roberto Gonzalez Nieves, of San Juan, Puerto Rico: "Every threat against religious liberty is a threat to human dignity itself." Journalist Jose Antonio Varela Vidal of ZENIT news service interviewed Archbishop Roberto Gonzalez Nieves, Archbishop of San Juan, Puerto Rico on the growing threat to religious liberty in the United States. A translation of the interview, released on July 30, follows.The Archbishop speaks on the Fortnight for Freedom campaign at the conclusion of the interview. ZENIT: Your Excellency, why are American bishops so concerned about the Federal Government’s Health and Human Services mandate? Archbishop Gonzalez: The Health and Human Services regulation consists in obliging employers, including religious institutions, to give medical coverage to their employees for sterilizations and contraceptives approved by the FDA [Food and Drug Administration], including abortifacient medication, as well as obliging them to give advice and education to women on sterilization and contraceptives. Hence the concern of American bishops is very genuine, timely and extremely necessary. When a government uses its faculties to oblige religious institutions and individuals as employers to act against their principles and teachings, when it obliges them to act against their conscience, it is a sign that religious liberty is being threatened and it shows that the government, far from respecting the Constitutional clause on religious liberty, is impairing it. ZENIT: What is the current state of this law? Archbishop Gonzalez: At present. the following two measures are being considered in the U.S. Congress: Abortion Non-Discrimination Act (ANDA) and Respect for Right of Conscience. The first reaffirms the basic principle that no health structure should be obliged by the government to carry out abortions or take part in them. The other measure is geared to protecting the right of conscientious objection. These measures would protect the right of millions of Americans to access the health system without violating their most profound moral and religious convictions on respect for human life. ZENIT: Has the Church mobilized in this regard, including with other religions and Christian denominations, because it is contrary to religious liberty? Archbishop Gonzalez: The State’s pretension to oblige a religious institution or an individual as employer to go against his principles, convictions and beliefs, is certainly not a matter that concerns one single religious denomination. What is at stake here is religious liberty itself in the United States. The State is called to guarantee and protect the right of freedom of worship of every member of society as guaranteed by the Constitution. This legislation impairs this principle. It is extremely alarming and worrying that it is the government itself, main guarantor of the Magna Carta, which threatens religious liberty. Today the right of religious liberty is trampled upon with the HHS mandate; tomorrow other non-negotiable principles could easily be compromised. In fact, given that it is a matter that touches the inalienable right of religious liberty, it concerns not only the Catholic Church but all believing citizens (and even non-believers), adhering to any religious denomination present in the United States, because this governmental action could make it clear that, with the pretext of the implementation of legislation of social and health interest, it can act at any moment against the religious liberty of any citizen. Moreover, this precedent in the United States, which up to now had been characterized by its supreme respect for the religious liberty of its citizens, can be used as the pretext by other countries to violate and to continue violating the religious liberty of its citizens. ZENIT: Why is religious liberty important for a society? Archbishop Gonzalez: I would like to answer this question with a quote from Pope Benedict XVI: "In particular, the Council Fathers approved, precisely 40 years ago, a Declaration on the question of religious liberty, that is, the right of persons and of communities to seek the truth and to profess their faith freely. The first words that give this document its title are 'dignitatis humanae': religious liberty derives from the special dignity of the human person, who is the only one of all the creatures on this earth who can establish a free and conscious relationship with his or her Creator. 'It is in accordance with their dignity that all men, because they are persons, that is, beings endowed with reason and free will..., are both impelled by their nature and bound by a moral obligation to seek the truth, especially religious truth'" (Dignitatis Humanae, n. 2). Cf. Angelus, December 4, 2005). The Health and Human Services mandate that, as we have seen, goes against religious liberty, makes it feasible for any government in the United States to impede, today or tomorrow - in an underhanded way for ideological or political reasons -, believing citizens and religious institutions, in a much as givers of employment, to profess and practice their faith. And as can be deduced from the Holy Father’s words, every threat against religious liberty is a threat to human dignity itself. ZENIT: What has been the population’s reaction to the U.S. Church’s campaign of the last two weeks? Archbishop Gonzalez: First of all, it is necessary to highlight the timely and responsible reaction of the U.S. bishops given this frontal attack of the government on religious liberty. The campaign undertaken by the bishops and by Catholics in general in the United States, already incisive on its own, cannot be measured by its short-term impact. The U.S. bishops have very wisely carried out a multi-media and multi-platform campaign. The bishops’ intervention transcends the present circumstance. Its main objective is to form the human conscience in such a way that, beyond the present contingency, people will know their duties and rights, with God, with themselves and with others, and will never be prepared to negotiate their principles with anyone, no matter how powerful he is. On the other hand, the present circumstance imposes efforts of immediate impact such as alerting, denouncing and educating, making use as well of the most effective network of Catholic lay ecclesial Movements which are dedicated to the defense of life and religious liberty. I was impressed by the response of the Catholic population of the United States to the call of their bishops when convoking the 'Fortnight For Freedom'. Of all the efforts, prayers is the most indispensable. The U.S. bishops and Catholic faithful, inspired in the words of the Apostle James, who assured that 'the prayer of the just man has power”, have prayed fervently, certain that ultimately 'our help comes from the Lord'. Steubenville, Ohio, home of a prominent Catholic university, has removed an image of the university chapel from its city logo after being threatened with a lawsuit by militant atheists. A federal court issued an order today that halts enforcement of Obamacare’s abortion pill mandate against Hercules Industries, a Colorado family-owned business. The owners of Hercules Industries — from left to right, James Newland, Paul Newland, William Newland, Andrew Newland — have won an injunction from a federal district court to stop the Obama administration’s health care mandate that requires employers provide coverage for abortion-inducing drugs, sterilization and contraception — a requirement they say violates their Catholic beliefs. The mandate has generated massive opposition from pro-life groups because it forces employers, regardless of their religious or moral convictions, to provide insurance coverage for abortion-inducing drugs, sterilization, and contraception under threat of heavy penalties. Alliance Defending Freedom attorneys obtained the first-ever order against the mandate on behalf of Hercules Industries and the Catholic family that owns it. The administration opposed the order, arguing, contrary to the U.S. Constitution, that people of faith forfeit their religious liberty once they engage in business. Since Hercules Industries would be required to begin offering the new coverage when its self-insured plan renews on November 1, Alliance Defending Freedom has requested a preliminary injunction that could prevent the government from enforcing the mandate against the company by August 1, the date when the company would need to begin the process of making changes to its plan. As is the case with many religious groups or employers, the mandate could subject the Newlands to millions of dollars in fines per year if they don’t abide by its requirements. “Every American, including family business owners, should be free to live and do business according to their faith. For the time being, Hercules Industries will be able to do just that,” said ADF Legal Counsel Matt Bowman after the decision. A restitution bill, which calls for the return of Church property seized during the 40 years of communist reign, passed the Czech Republic's lower house parliament earlier this month, but must yet pass the parliament's upper house for the bill to be enacted. Supporters view the move as a major step to end the legacy of Communism, but the opposition has pledged to block the legislation in the Senate. If the bill is successfully put into law, around half of all Church property nationalized by the communist government (worth about $4 billion) would be returned, and any property that cannot be returned would be compensated financially (around $2.8 billion), over the course of the next 30 years. Churches would, however, need to prove that they owned the property before Feb. 25, 1948, the day of the communist revolt. The Catholic Church would receive 80% of the property. Prague also pledges about $2.8 billion in cash compensation to the churches, split into 30 yearly payments. “It‘s crucial that we’ve managed to agree on it,” Prime Minister Petr Necas said in separate remarks. The Church property had been seized by the communist government between 1948 and 1989. The web site http://www.bosnewslife.com is following this story, as proponents and opponents of the restitution prepare for a Senate vote later this summer. Catholicism to Be Banned in America? What is at stake in the 2012 presidential election for the United States? In particular, what is at stake for the millions of Americans who have identified themselves as Catholics? And, how is the fate of the nation to be impacted by changes that may take place in the lives of American Catholics as a result of what happens at the polls in November? James V. Schall, S.J., professor of political philosophy at Georgetown University, writing in CatholicWorld Report of last week paints an alarming picture. If the Obama administration’s HHS mandate is not overturned in the courts (which seems unlikely in light of recent district court decisions) or at the ballot box, America will soon face a situation in which the Catholic citizenry must choose between its faith and its previously comfortable place in our society, indeed, perhaps between the faith and their livelihood. What will America look like when these good citizens are banned from the public square and economic marketplace? The laws will now be framed in such a way that anyone who does not follow government health-care policies, which will control the whole economy, will not find jobs that he can accept with clear conscience. “Catholics will not be suitable for public charities, medicine, education, journalism, or in the legal profession.” All of this elimination is in the name of “non-discrimination.” These are the normal areas in which Catholics, especially educated Catholics, have found their livelihood and place in civil society. Our institutions of higher learning, law schools, nursing schools, medical schools, and even business schools, to survive, will, in their minds, have to accept the law to survive. The Church’s moral positions will be seen to violate “civil rights.” Our lack of attention to the philosophic roots of “natural rights” is coming home to haunt us. “Rights” theory can justify anything. All of this control of the Church is being proposed in the name of natural and civil “rights.” In this atmosphere, Catholics will be something like their counterparts in Muslim lands. Their choice will be to escape to another land, to convert to Islam, or to be a tiny, tightly controlled minority with no opening to the public order. Both the Schall and Rutler essays are highly recommended reading. 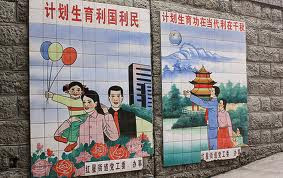 Chinese government propaganda posters idealize the one-child policy, but the reality is hundreds of millions of forced abotions. We reproduce in full this excellent report from LifeSiteNews. WASHINGTON, D.C., July 9, 2012, (LifeSiteNews.com) – “China’s one-child policy constitutes the longest-running and most far-reaching violation of human rights the world has ever seen,” Steven Mosher, the president of Population Research Institute, told a Congressional hearing this afternoon. Before the event was over, the chamber got to see the face of but one victim of the thousands of forced abortions Chinese officials perform everyday while carrying out Beijing’s one-child policy. “After the person in white pressed my belly with her hands and felt the position of my baby’s head, she stuck a big, long, fatal needle deep into my abdomen,” she told the panel. Her child’s body was placed in a plastic bag near her, allowing her to see that she had been expecting a boy. After being told to stop fussing, she eventually gained the strength to walk out of her room. China Aid President Bob Fu, who brought Yanling's story to this week's hearings in Capitol Hill. Her testimony gave the House Committee on Foreign Affairs a human face to match the countless, anonymous women abused by the nation’s family planning system. Bob Fu, president of ChinaAid, told the committee Yanling’s story , although tragic, was anything but unusual. Mosher said PRI’s investigative teams visited five provinces in China, logging 80 hours of interview that prove Beijing is lying about its coerced policies. He said minorities – such as the Manchus, Uyghurs, and Tibetans – are not exempt from the one-child policy as the government claims, and family planning officials overseen such abuses as “the abduction and selling of ‘illegal’ children” or threatening to demolish villagers’ homes if they do not pay astronomical fines for having more than one child. Much of this took place in counties the UN Population Fund deemed models. “UNFPA’s claims that it is a moderating force in China do not accord with the reality of its complicity in coercion,” he said. Those who testified called on the Obama administration to pressure China to end quotas for abortion, to prosecute the officials responsible for Feng Jianmei’s abortion, not allow population control officials to travel to the United States, hold U.S. corporations with factories in China responsible for cooperating with the brutal regime, and to make sure no U.S. funds help facilitate forced abortion. However, the UNFPA and the International Planned Parenthood Federation “have worked hand-in-hand with the Chinese population control machine,” she said. While Americans assess what pressure they can bring to bear from without, Bob Fu said China is changing from within. He observed that both Feng Jianmei and her husband are Christians, as are the lawyers representing them. “In Chinese society, where political corruption and bankrupt moral ethics prevail, the Christian faith is providing strong support to the people’s pursuit of justice and love – and is also giving them the courage to stand up to evil forces,” he said. Monday’s hearing took place before the Subcommittee on Africa, Global Health, and Human Rights, which is chaired by Rep. Chris Smith, R-NJ. Full testimony is available here. Our nation's freedom depends on getting religion back into our nation's economic life, says Fr. Robert A. Sirico, president of the Michigan-based Acton Institute for the Study of Religion and Liberty, in his new book, Defending the Free Market: The Moral Case for a Free Economy. “Can it be mere coincidence that we are beset by decline just as the Judeo-Christian worldview has retreated from the public square?” asks Fr. Sirico. He argues that “the link between economic liberty and public morality is not tenuous; it is clear and direct” and explains his thinking about how bad ideas on economics stem from bad ideas on the nature of the human person in a compelling interview with National ReviewOnline. To the extent that socialism holds back creativity and thus productivity, it increases poverty. When people become desperate, even good people can become self-centered. Few of us are at our best in crowds where everyone is trying to get out the same exit, or when trying to grab for the last remaining sale item. Socialism begins with the material world (the redistribution of pre-existing things); capitalism begins with ideas and dreams (the creation of things). Socialism increases the hoarding instinct and often places power in the hands of petty dictators (wait in line in a governmental office to see what I mean). We all know where that leads. I think it is good to remember that the internal polarization that took place after the Second Vatican Council between those who adopted the hermeneutic of rupture and those who maintained the hermeneutic of continuity (to use the pope’s categories) is that the former tended to abandon a more theological understanding of the Church and its role in the world and diminished it to a merely political, “historically conscious,” and socially activist (sometimes even socialist!) paradigm. This means that those who opt for the rupture model care more deeply about politics — in fact, it seems to be all they care about sometimes – and see it as the core of the Church’s mission, whereas those who see the Church today as the same Church prior to Vatican II believe that the primary role of the Church is human redemption and salvation. When, in effect, Caesar impedes the Church’s salvific mission (which is what the building of our institutions is all about), then this clearly ties back to what the Lord said in Matthew 25: What you do unto one of the least of His brethren you also do unto Him. As in most institutions dominated by politics and bureaucracy, a gap grows between those being served and the ones doing the “serving.” This is especially the case when the bureaucracy is far away from the need and the principle of subsidiarity is ignored. The latter do not know the former and it is difficult to have real compassion without personal relationships. Human beings are lost sight of in politics and bureaucracy. Read the whole interview at National ReviewOnline.